"We take our residents' safety very seriously"
It is important to NEVER open the door for strangers. We take our residents' safety very seriously here at Drewlo and we want to keep you, your fellow residents, and your possessions secure. Please do not feel you are being rude by not allowing strangers into your building. Letting people you do not know or have not seen before into a building can be a major safety issue. Apartments are private residences, so the person entering must be a verified visitor. 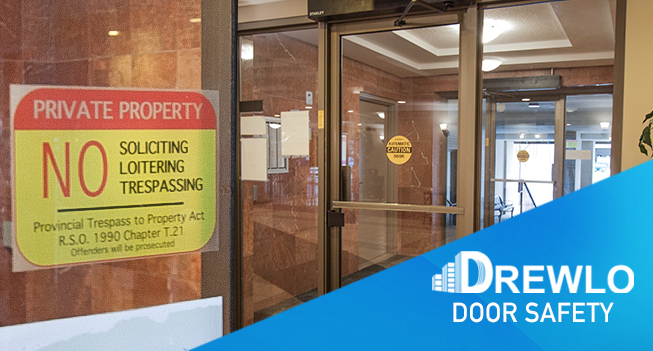 If you see a stranger trying to follow you into the building, you can politely point to the sign indicating that they must buzz in so that a resident can let them into the building, or they can register as a guest with our property managers. If you ever feel unsafe during a front door encounter call 9-1-1. Or, if it's a less serious matter, please bring it to your building manager's attention.